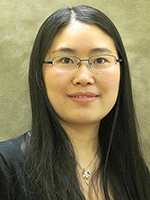 Congratulations to Dr. Yaling Liu, postdoctoral researcher at Pacific Northwest National Laboratory, for being awarded the Elizabeth Sulzman Outstanding Publication Award for her paper "Agriculture Intensifies Soil Moisture Decline in Northern China." The research was published in Nature's Scientific Reports in 2015. Liu, working at the Joint Global Change Research Institute (JGCRI), a partnership between PNNL and the University of Maryland, was chosen for the award from the Ecological Society of America as a graduate student in the biogeosciences field. Liu received a PhD in atmospheric sciences from Purdue University in 2014. The award was presented at the ESA Annual Meeting 2016, August 9, in Fort Lauderdale, Florida. Liu, a member of the American Geophysical Union and the Ecological Society of America, received a BS in geography from Hubei University and a MS in meteorology from China Agricultural University. Her current research at JGCRI addresses the water-energy nexus, energy-driven emissions, desalination, and the enhancement of a water module in PNNL's integrated global land use-energy-economy model, the Global Change Assessment Model.